We'll get to designing with succulents another day - I don't have any good pictures of my process at the moment! In the meantime, we’ll start with growing and propagating, plus the varieties that I’ve had success with, and maybe a few that I covet with all my soul. Succulents are probably the easiest and perhaps most profitable plants we grow. They are extremely popular for weddings right now, and the trend shows no signs of slowing, so I keep propagating. I started propagating succulents pretty much accidentally, when a leaf detached from one of mine and started growing roots. "Wow," thought I, "It's cloning itself. Genius." So I bought some mother plants from the big box store and my local nursery and started popping their leaves off and sticking them in the soil. Soon I had a whole succulent hive. They cost almost nothing to care for, except water, a little bit of time, and electricity, and they are brilliant for boutonnières, flower crowns, centerpieces, wedding favors, and wearable jewelry à la Susan McLeary, AKA @passionflowersue. They are a bit fussy to work with in design, but we'll get to that another day. I grow succulents under fluorescent lights in my basement, and they seem to love it. They don't stretch, the way they always do if I have one just out in my living room, but I imagine if you have a VERY sunny window they would also stay in their compact rosette form. I use the T5 fixtures that I also use for starting my annuals and perennials in the early spring, on a timer that gives the plants a 16-hour day. At first, I was growing succulents in 2-inch nursery pots, the kind that fit 32 per standard tray. These pots are quite deep, and I found that about half the soil was not being used, since succulents have fairly shallow roots. So when I got my new soil blocker, I started putting them in blocks. They love it! I think they actually grow faster. I mix an all-purpose organic fertilizer into the soil before planting, according to the label instructions, but I've also planted them in plain soil with nothing at all in the past and they were fine. I don't use a special quick-draining cactus soil, because it's not necessary in our very dry climate - I just use a basic potting soil, whatever we have around for our regular starts. If you live in a moist area, you may find that a fast-draining soil is necessary. Succulents growing happily in their 2-inch soil blocks. Succulent flowers are kind of a nuisance, but they are super beautiful. Succulents like it dry, warm, and bright. I water when I notice that the plants are a little bit floppy, that the leaves are not a rigid as they should be. I water my new baby plants much more often than my big plants, which seem to tolerate long stretches without water just fine, but I don’t water on a regular schedule - I just feel it out. I think I could probably wait 10-14 days between waterings. I only ever bottom water my succulents, because my water is very hard and leaves behind mineral spots on the leaves which do not come off, and I can’t have that on the plants I use for weddings. Every month or so, I add an organic liquid fertilizer to the water and let them soak it up. I try to use a fertilizer with high nitrogen and low potassium - I don’t really want the succulents to flower, because they produce big long fat stems that can deform the perfect spiral shape. However, the flowers are stunning and tropical-looking, and they can add a lot to a corsage or boutonniere. They last forever, too. Until recently, I didn’t have any problems with pests. I do see tiny insects nesting in the soil around my succulents’ roots, and I have had some die from root worms, but not many. I’ll just notice one day that the plant is dying, and if I pull it out a bit, sure enough, it just pops out of the soil because the stem is eaten through and rotten. I just get rid of the contaminated soil, bleach the container, and start over. Some varieties seem more susceptible to this problem than others. Eew. You can see the scarring from aphids on this one. Since applying the insecticidal soap though, the center has greened up. Aphids. Ew. But also, this shows how plantlets can arise from the stumps of beheaded plants. Plague of horrors, however! I’ve recently had an issue with aphids eating the new growth of plants - from old ones to brand new babies. It is not nice! They leave gross sticky stuff (honeydew) everywhere, can scar the leaves, and keep the plant from growing. They are tiny little blue-gray dots, and every time I think I’ve killed them, they come back. LAME. I’ve started using Safer brand insect soap, and it does kill them, but they are so sneaky that they hide form it and some always survive. Lady bugs may be next, or neem oil. Anyone have experience with aphids on their succulents? Other than the aphids, there’s just not much to worry about with these tough, beautiful creatures, and they keep giving and giving. Some of my succulents are huge! These ones are about 3 years old, and they have been beheaded and replanted a few times - they just keep truckin’. Succulents just want to take over the world! It seems like all parts of the plant will product a new one, if given a chance - all I do to propagate is create the right conditions and accelerate the process. 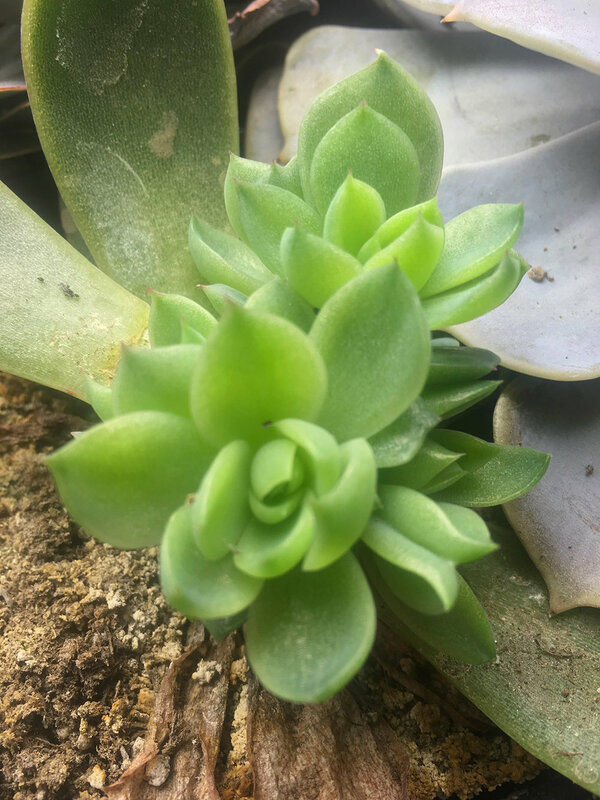 It does take a while - about 9 months to a year for a leaf-propagated succulent to reach 4-5 inches in diameter, depending on variety. I use three different strategies to propagate my succulents. Leaf method: Starting with the mother plant, I choose a fat, healthy bottom leaf (or, I choose many fat healthy bottom leaves all at once). Bigger leaves tend to produce bigger, faster plantlets. Wiggling the leaf back and forth, I move it until it pops off the stem without tearing either the leaf or the stem. Sometimes I fail and hurt the leaf or the stem - some varieties are more compliant than others. When I have my collection of leaves, I toss them into an empty flat and let them have a little light, though they don’t need much. If I’m trying to propagate a very desirable or hard-to-sprout variety, I’ll use rooting hormone according to the package instructions. It takes at least 2 weeks for the leaves to start making their tiny, red roots. Some plants start making new plants before they make roots, and some never get around to rooting, while others make roots, but never make a new plant! Ideally, you want both. One the leaves start to make roots, I put some moist soil into their flat, so the roots will have something to grab onto while I’m waiting for them to make plantlets. Then, once I see plenty of roots on a leaf with a good sized plantlet, I pop it into a soil block, just nestling the roots down into the block and snugging them in. I keep these flats well-watered until I can tug on the plant and feel resistance from the roots. After that, they’re pretty much home free! Little red-pink roots coming off a nice leaf. A wee plantlet settling into its new soil block home. Stump method: I use this method for plants that are difficult to propagate via leaves - sometimes, they just don’t want to make roots or new plants. I discovered this method back when we had giant pack rats that terrorized our basement - they would bite the heads off my most beautiful succulents and take them back to their shadowy lair. But, soon after, the stumps of these beheaded succulents would begin to sprout tiny new plantlets, right where they had been guillotined. I simply waited for these babies to grow large enough to cut off, and then snugged them down into a new soil block. This method, along with the next one, produces the fastest clones - they are already primed to live and have had the support of the mother plant throughout their development, whereas the leaves have only that one tiny part of her. To cut off a new plantlet, sterilize your cutting implement (I like needle-nosed snips or trimming shears with very skinny points), and snip the plant out near the stem of the mother plant. Make a loose hole in the soil block or other medium and place the stem into it gently, pressing the soil in around it for good contact. Here are some out-of-focus plantlets growing from the stump of a rat-ravaged giant. Here's the rooting hormone I use occasionally. Sucker method: This is the easiest method and produces great clones. 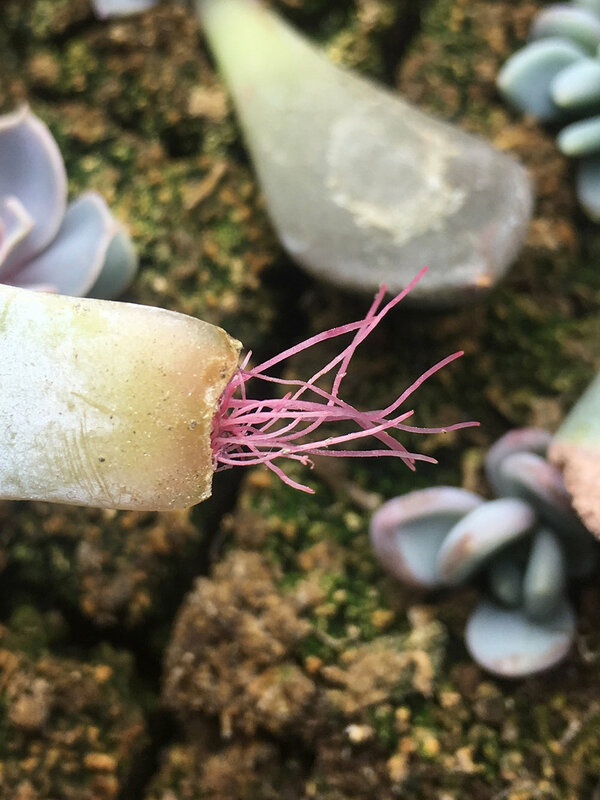 Most succulents, once they reach a certain size, will begin to make suckers, sometimes from the main stem , but often from below the soil line. 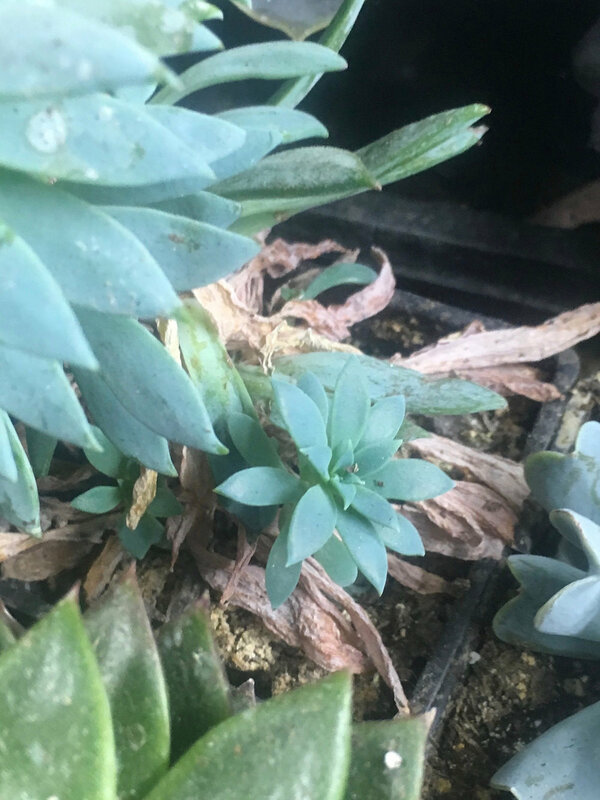 All you have to do is a little hunting - lift up the lower leaves of your older succulents, and you’ll probably find some babes under their mommas’ skirts, just waiting for a new home and their time in the sun. Just snip them off and plant them in a new soil block. They’ll get growing immediately. make sure you just plant the rosette, no the stretched stem, as they don’t have roots to support any height. New succulent clones from leaves often make multiple plants, as well, and these can be divided to further multiply your stock. Wait until the plants are fairly big, and then snip off the biggest sister - she’s got a lot of energy, while the other sibling can still be supported by the roots she’s already grown. This little sucker is coming out of the soil from beneath her momma plant. Often, new plantlets will come in pairs, triads, or quartets. They can be divided. The best rosette succulents are Echeverias and Sempervivums, but there are many other genera that make great succulents for favors and just general enjoyment. I actually think the zebra plant is my favorite, but it’s very slow and not great for propagating. FairyBlooms is a fun Instagram to follow and they have a great selection in their online shop, though of course I recommend using your local nursery whenever possible. They also sometimes have the most coveted succulent of all, the variegated “Compton Carousel.” You’ll pay out the wazoo for it though - almost $50 for a 4-inch plant. It’s rare! I don’t know the names of a lot of my succulents, but I do know a few: here are the ones I currently grow. Lilacina - Very productive, easy to propagate, and grow quite large. Lipstick (?) - not so easy to propagate, but very pretty and worth the effort. Perle Von Nurnberg - easiest and most productive of all, fast to size. Black Prince - Beautiful color, but susceptible to root rot. and a bunch of others. How do you propagate succulents? What varieties do you like? What god should I pray to to save me from this plague of aphids?